My inspiration for felt making is two-fold: The textures, patterns and rhythms of rural Vermont and the source fiber from my flock of Navajo-Churro sheep. I explore form and surface with the primitive, sculptural quality inherent in this rare breed’s wool and with other fibers and materials. 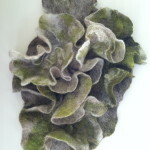 The physicality of the wet-felting process enables me to design with movement and gesture. 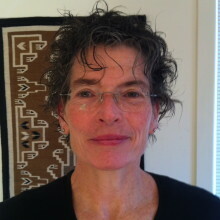 Formerly a professional modern dancer with Repertory Dance Theater and dance faculty at Dartmouth College, I live on a small farm in Barnet, Vermont with my husband and perform puppet theater/modern dance with Company X based in Nova Scotia.